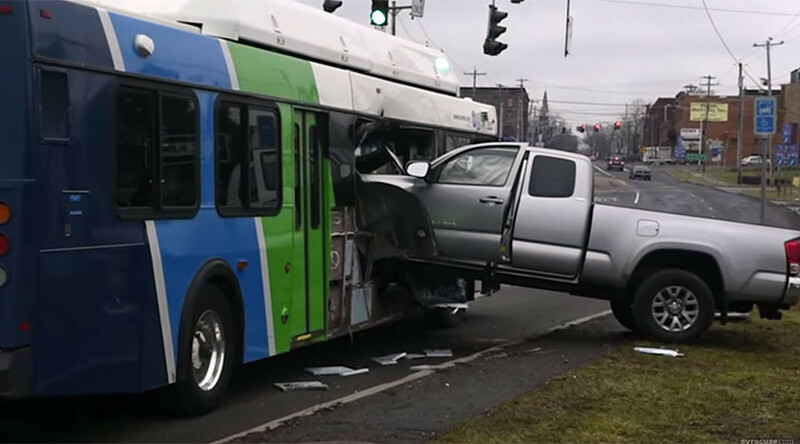 A passenger bus in Syracuse, NY was struck at high speed by an out-of-control truck on January 19, sending one passenger flying through the air and others running for their lives. The incredible scene was captured from multiple angles by on-board cameras. One woman who spotted the oncoming vehicle attempted to warn her fellow passengers, shouting, “Watch ou-!” but she was cut off by the sheer force of the truck plowing into the side of the bus. Such was the speed of the truck that passengers had just a split-second to react before impact. A small fire broke out between the truck and the bus but quickly burned itself out. Passenger Herbert Barry was the most seriously injured, suffering a broken leg and an injured hand in the collision. Eight people were taken to hospital following the crash. "Alright? Is everybody alright?" bus driver Daphne Ross-Powell can be heard saying in the immediate aftermath. The driver of the truck reportedly saw a line of traffic ahead and, instead of breaking, accidentally put his foot on the gas pedal. He then lost control and slammed into the side of the parked bus, Syracuse Police Department spokesperson Sgt. David Sackett told The Post-Standard. He was ticketed for failure to reduce speed on a curve and failure to keep right on a highway.